The Cosmas Hercules V2 is a 9" high, leather lace-up mountaineering-style boots that meets or exceeds NFPA 1977, Standard on Protective Clothing and Equipment for Wildland Fire Fighting, 2011 Edition. DESIGN - Mountain inspired design - the first true mountaineering boot designed for wildland fire fighting. UPPER - One piece, full-grain, water, flame, chemical, and cut resistant leather construction, 2.4 - 2.6 mm nominal thickness, 6.5 oz. COLLAR - Soft, full-grain leather-bound 2.75" padded collar for superior comfort to accommodate individual leg sizes. PULL STRAP - Low profile, 1" wide, triple-stitch reinforced, full-grain water and flame resistant leather. LACING HARDWARE - Bottom to top: 8 closed speed loops, 2 lace locks, 8 open speed hooks. LACING SYSTEM - Dual-Zone Contact Lacing System: Anatomically asymmetrical, with free-floating lace points that allow the upper to conform precisely to the shape of each individuals foot. The first speed hook is a lace lock, allowing the user to tighten the forefoot area, lock the lace, then tighten the upper portion for a personalized fit. LACING - 100% Kevlar braided fibers. Two laces per pair. ACHILLES FLEX POINT - Accordion-style flex point in the Achilles area so the boot can flex where you do. LINING - Durable non-woven polyester. FOOTBED - Triple-density, removable footbed made of microfiber suede, felt, and ergonomically molded EVA. Wicks moisture and dries rapidly. EVA provides cushioning. OUTSOLE - High traction, abrasion resistant, oil, flame, and chemical resistant, nitrile rubber outsole equipped with ergonomic HEELROLL and TOESPRING to promote a natural walking motion. 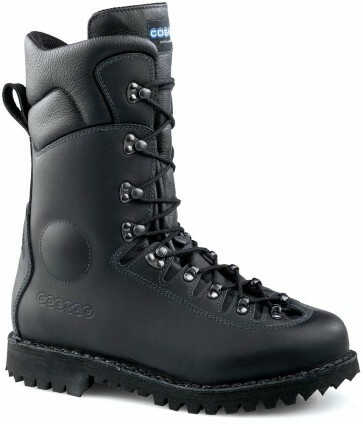 Mountaineering lug design provides maximum traction on various terrain. Multi-directional lugs provide user with sure-footed edging, braking, kickoff, and stability. High profile ladder grips for gripping on roots, branches, sticks, and stones. Specially formulated compound (nominal durometer 66 Shore A) provides superior traction without sacrificing abrasion resistance or durability. Welted construction allows for sole replacement. MIDSOLE - Full-length 5 mm hi-density rubber midsole. COMFORT PADDING - Open cell polyurethane foam padding strategically placed throughout the upper for superior comfort and support. OUTSOLE ADHESION - A 2-component, high-temperature polyurethane adhesive system is used to bond the outsole to the midsole. Outsole is also stitched to midsole in forefoot area with tough, fire-resistant Kevlar thread. MARKINGS - Interior label containing all information required by NFPA 1977 Standard on Protective Clothing and Equipment for Wildland Fire Fighting, 2011 Edition.